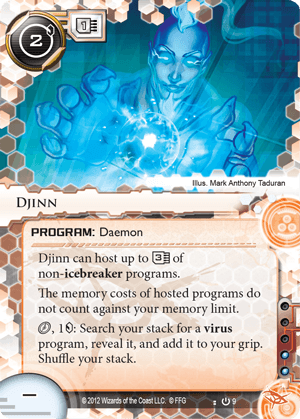 Djinn can host up to 3memory unit of non-icebreaker programs. click, 1credit: Search your stack for a virus program, reveal it, and add it to your grip. Shuffle your stack. The ability to host more programs for less memory is one of the first thing that new Netrunners are drawn to. Its true power however comes from the ability to tutor for any (virus) card for only a click and a credit. Tutors are powerful in Netrunner, to find what you need, when you need it, not relying (too much) on the vagrancies of the draw. Djinn has remained a staple of virus decks which always need more memory, and the ability to find what they need when they want it. It is also the first Daemon, a design space that is still not explored very far. All Daemons host programs with various effects for those programs. Daemons are useful, but the fact that programs hosted on them are trashed if the Daemon is gives an inherent weakness to that. Given the increase in abilities of the Corp to trash programs, this becomes more and more of a weakness. Still, Djinn remains useful for both its effects (Memory compression and tutoring) and will continue to remain a player where virus cards are concerned.